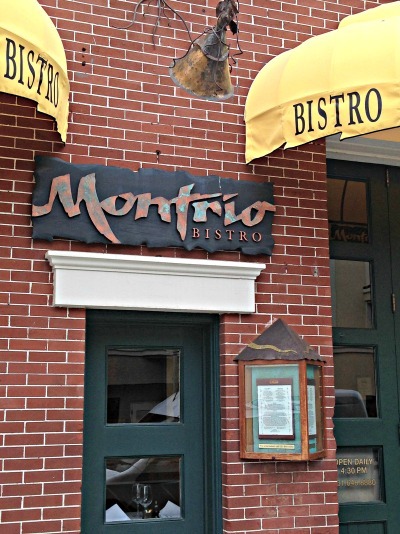 Montrio Bistro was opened in 1995 in the slightly bohemian heart of Monterey's historic district and serves what has been referred to as "New American cuisine." Chef Tony Baker brings European influences and an exciting selection of menu items for even the most persnicidy palate. Once a Monterey city Firehouse and a JC Penny warehouse, Montrio opened in this prime section of historic Monterey claiming an "Easy Elegance" attitude toward dining ... and it has paid off nicely! Zagat reviewers use a scale of zero to thirty points when evaluating food, service and ambiance in the restaurants that their teams visit. Montrio received a Zagat score of 23 for their culinary specialties which translates for the rest of us as "Very good to excellent" cuisine. The ambiance is cozy...even romantic, with puffed clouds hanging from the ceiling and art work scattered throughout the dining rooms. There are a few cozy tables in the corner in the main dining room that offer a more romantic setting. All tables are covered with white paper and crayons are issued for whatever your creative mind chooses to display. If this is a first date, it's a great way to start the evening especially if you have an artistic inclination. You might learn a lot in the first 15 minutes of table doodling about your date and the smiles just seem to come naturally! The staff at Montrio have been around for awhile and are patient and skilled guides offering insight into favorites on the menu. You might try the bacon wrapped shrimp as a beginning appetizer, and then when you find yourself ready ... maybe feast on Wild King Salmon, Portobello Ravioli or perhaps Capellini with Parmesan for a lighter indulgence. For some reason the Bread Pudding is very popular ... I will leave that for your review. This is a perfect place for that first "Date Night," and to make it even better, the staff at Montrio Bistro have arranged the ideal first date evening.... dinner and a movie for $29.95. Your meal includes your choice of soup, sand dabs or ravioli, and a main course. The theater is in the same neighborhood as Montrio's and is a clever little "Non mainstream" independent theater house called the Osio theater. This tiny theater receives mixed reviews. The movie selections are great as are the comfy chairs and well buttered popcorn, but make sure you get there early or you will find the small movie rooms are a bit cramped. Your best option is to sit in the back to avoid staring up a the screen for a couple of hours. This is definitely a funky theater and not for everyone, but with great movies not seen elsewhere, and a vibe that invites a regular crowd, you and your date just might find it to be an adventure especially if don't mind a few surprises. Anthony Vitacca is the resident Mixologist at Montrio and the patrons love his eccentric mixes of the best of libations. Cocktails have evolved in recent years, and Anthony mixes tinctures, marmalades, aromatic bitters and some secret ingredients to bring new adventure to the art of making your drink. If you feel spirited, try the Monkeying Around cocktail with Irish Whiskey, Bananas, some secret stuff and a chunk of Lula's sea salt carmel on the side. If you have ever tried Lula's chocolates from Carmel, this alone is a real treat for the palate. Should you find yourself in the neighborhood on Sunday, several bottles of wine are offered at half price and there is a suprisingly large selection of premium wines. Many of the regulars at Montrio Bistro love the "Tiny Bites" dessert concept. Paired with one of Anthony's "inspired" coffee's, it's easy to linger over that mug of coffee and the itty bitty desert portions. No indulgence, just restrained yumminess.